# Put the grape molasses and cold water into a pot which is not aluminium, and mix well. # Put 5 tbsp from the mixture aside. Place the pot over medium heat. 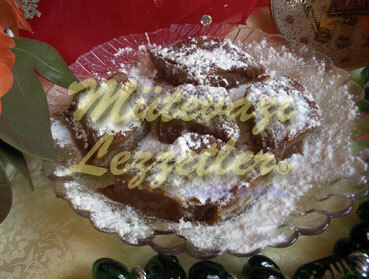 # When the mixture of grape molasses and water starts to boil, add the flour little by little. In the meantime stir the mixture consistently with mashing it. # When the mixture gets smooth, add the 5 tbsp mixture which you put aside before over the halva and mix. # Pour the halva into a flat plate or a small tray, flatten its upper side. # Cut into pieces however you want, pour red-hot butter all over. # Sprinkle castor sugar all over the halva, which was rested in the room temperature for 2 hours, just before serving. Note: You can use carob molasses instead of grape molasses also while cooking Orphan Halva.